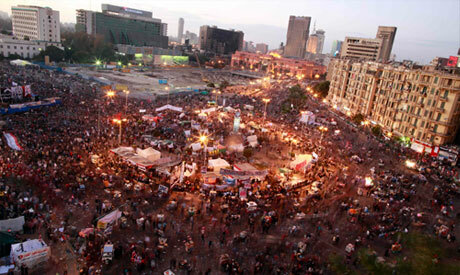 The street, parliament and military: Will the protest movement speed up Egypt's transition? Egypt's ruling military council has reportedly asked its advisory council to consider the handover of power to a civilian authority ahead of schedule. While the military has repeatedly vowed to relinquish executive authority following presidential elections in June, revolutionary groups are demanding the immediate transfer of power to the speaker of Egypt’s newly elected parliament or an interim president. The advisory council, which consists of prominent political and intellectual figures appointed by the military council for “consultative” purposes, is expected to present its proposal within 72 hours. The military council made the request on Saturday at a meeting with members of the advisory council. The meeting was convened to discuss recent escalations that have coincided with the revolution's first anniversary on 25 January, which featured calls by a number of revolutionary groups for an immediate end to military rule. Sameh Ashour, deputy leader of the advisory council and head of the Nasserist Party, has proposed that the military council hand over power ahead of schedule following a constitutional referendum aimed at granting parliament the right to appoint the constituent assembly – tasked with drawing up a new constitution – without waiting for the results of elections for the Shura Council (the upper, consultative house of Egypt’s parliament), which kicked off Sunday. This, said Ashour, would allow the military council to step down sooner than originally proposed. According to the terms of a constitutional referendum held in March of last year, in the event that a new constitution has not been written before scheduled presidential polls, the elected president would hold power for one year while a new national charter is drawn up, before fresh elections are held, Ashour told Al-Ahram. In a related development, the ruling council declared that judicial authorities would take over investigations of recent violence between revolutionary activists and security forces that have left at least 50 protesters dead. Meanwhile, Freedom and Justice Party Secretary-General Mohamed El-Beltagy has pledged the party's support for the scheduled transfer of power in June following presidential polls. “The Muslim Brotherhood has already departed Tahrir Square and only young people remain there,” El-Beltagy told Ahram, referring to this weekend’s protests against military rule. Presidential candidate Selim El-Awa, for his part, has called for presidential elections to take place in April. Twenty-seven revolutionary groups and parties have called for the military council to step down, saying that they oppose holding parliamentary polls and drafting a new constitution under military rule. The Revolutionary Youth Coalition, meanwhile, is calling for another round of protests against military rule on Tuesday, 31 January. Hundreds of protesters remain camped out in Tahrir Square, where they are maintaining a sit-in that began on 24 January. Sounds like military rule will end if they are asking a consultative counsel their thoughts on the transfer of power. I hope it happens after the elections in Feb. It would go a long way to adding stability to Egypt.